Riding the same bicycle for 21 years is no mean feat. The fact that it’s still in her possession is a testament to proper security and the smooth running drivetrain is more than ample proof of it receiving proper care and maintenance. There really isn’t anything wrong with that old red mountain bike, the steel frame is in good condition. But then the long stem and knobby tires were designed to slam down mountain trails not neighborhood streets. Wouldn’t it be fun to have a new sleek machine to zip around town, the place where she lives. We agreed with him wholeheartedly. Carolyn, his wife, would certainly appreciate a new bicycle to celebrate Spring of 2019. She won’t be commuting to work but she will be hopping on the South Platte or Cherry Creek bike trail for an afternoon of cycling fun and she will most definitely be bike riding in the city. Soma Fabrication’s Buena Vista, a modern mixte design that recalls the classic European mixtes of the 1980s. The newest incarnation of the Buena Vista is painted a pearlescent white and is disc brake compatible resulting in a visually pleasing frame with the potential for being very sporty. 650B wheel size is a nice compromise between Carolyn’s old 26” mountain bike wheel size and the larger 700c road bike wheel size. She will appreciate the quick handling of a smaller wheel size. The 650B rims allow her to run a slightly wider tire, offering comfort and stability on our rough city streets. We recommended a traditional boxy rim and high flange hubs, these details match the classic lines of the Buena Vista and add to the durability of the wheel. A 2X9 drive train will allow Carolyn a wide range of gears for accomplishing hills and even an occasional mountain path. The Ahearn handlebars have an ergonomic bend at the grip area, relieving the pressure Carolyn’s wrists felt on her old straight bars. Close Out of all in-stock 2018 Bicycles! The month of March along the Front Range can produce lovely Spring conditions but more typically it is a month of unpredictable heavy wet snow storms. This intermitant weather creates a problem for bike shops trying to get the neighborhood psyched for the Season! We’ve decided to create a little incentive for Spring Fever by marking all 2018 bicycle 20% off until they are sold out. We have some great options in stock just check out our New Bikes Page. when your bike shop doesn’t raise their tune up rates. It’s been a long while since I have been on a bicycle tour but I expect that drought to end this year. Maybe I can find a new place to explore. Somewhere that offers challenging climbs, seascapes on the horizon, gravel trails that meander through quaint towns, and clean campsites available every night. If 2019 doesn’t allow me an international bike trip there are plenty of options in our home state too. My last dedicated bicycle trip was in 2011. My husband and I rode our bicycles up and down the rolling hills of Tuscany for 2 weeks. (Let me know if you would like to hear about that trip). Experiencing the natural environment from the bicycle saddle is unlike any other travel experience. Not only does time slow down, but you taste your surroundings with all of your senses. There are many ways to approach this type of trip. Before I begin researching the logistics for my 2019 bike tour I have already begun physical training. You never know who you will meet on top of the pass, food truck in the French Alps. Once I arrived to in France for a 2 week bike tour through Alsace Lorraine and Germany without completing any pre-training whatsoever. I had hoped that my daily commuting habit would provide enough of a base for the trip, unfortunately not. On those first few days on tour I was only able to ride comfortably for a few hours at a time. My lack of physical preparation was frustrating until my stamina finally kicked in. — Ernest Hemingway , Selected Articles and Dispatches of Four Decades by Ernest Hemingway. New York: Charles Scribner's Sons. I urge you not to make that mistake. whether you are planning a solo two day bike adventure or a 2-week bicycle tour with friends you should begin training as soon as you can, 4 months is the minimum that I recommend. With a little physical training you will hold yourself in a better position on the saddle and ultimately be more comfortable. My 4-month training schedule is a loose guideline for non-competitive cyclists. Competitive cyclists have much more rigorous training schedules involving resting heart rate and revolutions per minute. I don’t have the patience for this type of training. I simply want to capably ride for 4-6 hours a day with enough energy left to enjoy my evening meal. Ride in all weather, because you will have to do the same on your bicycle trip. Complete longer rides on your non-interval days, these are your spin days. A stable core helps with balance, your posture, and makes you a more efficient rider. After a month of travel, cold winter weather, and socializing I’ll be returning to my basic routine of calisthenics and modest weight lifting soon, very soon. My typical routine includes 10-20 minutes of sit-ups, push-ups, squats, lunges at least 3 times a week. If you have a bad heart or other health problems please coordinate your bicycle training plans with a trained professional like a Physical Therapist or a Doctor. These training techniques are flexible allowing you to adopt the mileage goal that fits with your abilities. It is much easier to maintain a consistent schedule if you note your progress on a calendar or maybe create a WhatsApp group to keep you motivated. Remember that the primary objective is for you to enjoy bike riding, even throughout the training process. The end result will be spectacular. 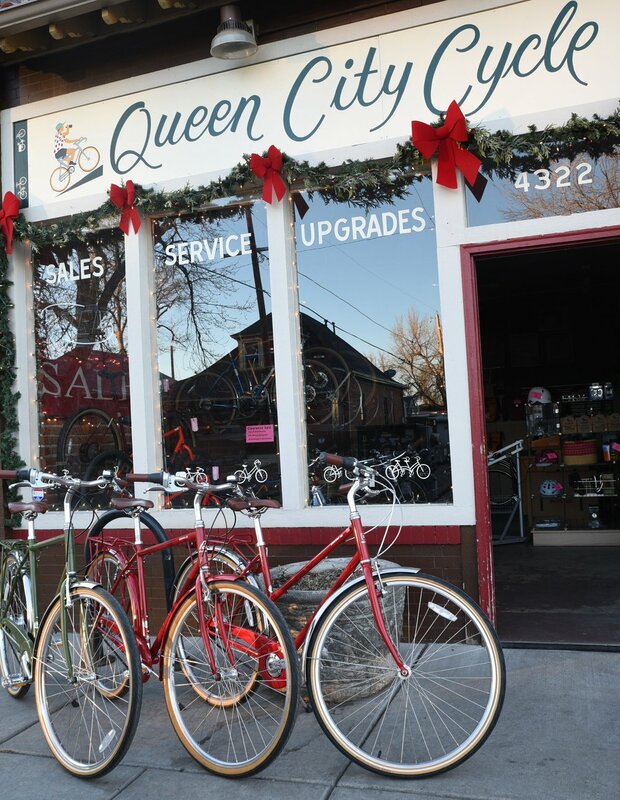 The Front Range is going to enjoy a few more sunny days before Christmas arrives so I hope you take the chance to grab your bike for a quick ride around the neighborhood. If you happen to find yourself on West 35th Avenue stop in to say hi! Merry Christmas, Happy New Year, and Jolly Times everyone! Available in any denomination and can be used for service, bike parts or accessories. We have English panniers, saddlebags, and handlebar bags in stock, available in a variety of sizes. .
We’re open through Christmas Eve and will be closed for Dec. 25-26. Happy Holidays! Witnessing loving relationships is such a joy. As a retailer, I have met many happy couples and never tire of hearing the stories of how they met, when they first realized that they shared a deep connection, or how they maintain their love through the tribulations of life. Their stories inspire me. The small things we do for our loved one at home is a clear testament of our adoration and commitment to one another. Rituals such as preparing breakfast for your lover, offering a warm squeeze before heading out the door, or brewing a pot of tea on a cold winter’s afternoon, these actions become the foundation of our relationships. But then once in a while a big surprise adds just the right amount of excitement to the mix. It’s not the parties, warm drinks, or cozy evenings tucked in that makes the holiday season the most romantic time of the year it’s the presents! Giving gifts communicates our affection and in a way demonstrates that we have been listening. It’s the best feeling in the world when we find just the right gift. More often than not a new bicycle is the perfect surprise gift or in the case of Scott and Shannon a restored classic bicycle was the perfect surprise gift. Knowing that Shannon appreciates the aesthetics of classic bicycles Scott found a wonderful English 3-speed for her. He kindly chose our shop to complete it’s restoration. When we receive a project of this nature we interview the owner of the bike in order to understand their expectations. We have worked on Shannon and Scott’s bicycles for many years and understood that Shannon enjoys riding her bike to her job located in central Denver, and she enjoys riding around the Highlands neighborhood with her family. Our intent was to maintain the integrity of the original bicycle but also make it enjoyable to ride. One of Scott’s first concerns was the condition of the original wheel set. We agreed with him that an upgraded wheel set with modern hubs would clearly make the Triumph easier to ride in our hilly neighborhood. The boxy, shiny rims we used match the Triumph’s vintage style. The rear wheel features a new Sturmey Archer 5-speed internally geared hub giving Shannon a better range of gears than the original 3-speed. The front wheel has a new dynamo hub to generate her brand new Bush+Muller LED light system. We installed a vintage vegan seat since Shannon is a strict vegetarian. Upon completion of this project Shannon received a bicycle that will reliably take her through our city neighborhoods day and night. 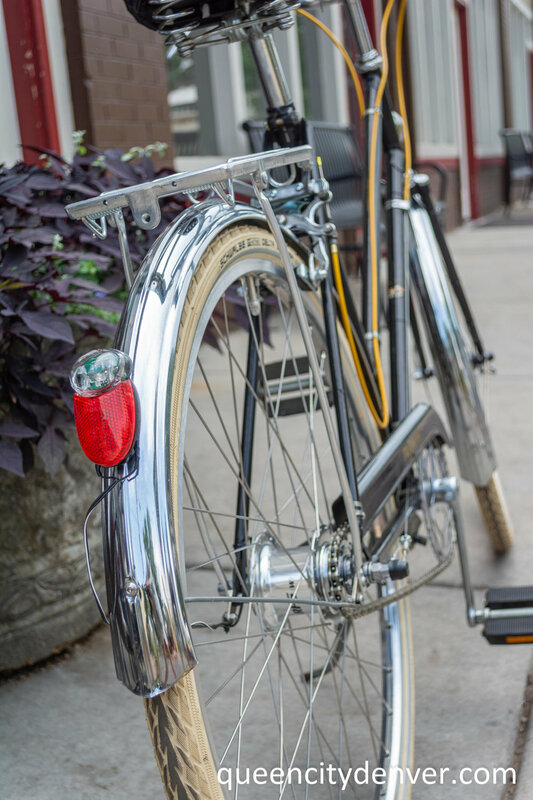 The vintage, beveled shiny fenders will keep her clean, and the rear rack can carry her essentials for the day. The perfect bike for Shannon. We currently have a few vintage frame sets in the shop that can be restored upon request. But even easier, all of our 2018 bicycles are marked down 15% off for the holidays! Winter will be here in one short month and we are still enjoying bicycling along the front range. Clear skies, brisk air, let’s keep it going. We realize the inevitable will be upon us soon enough and this year we have too much inventory left in the store. Easy remedy, Store Wide Clearance Sale! 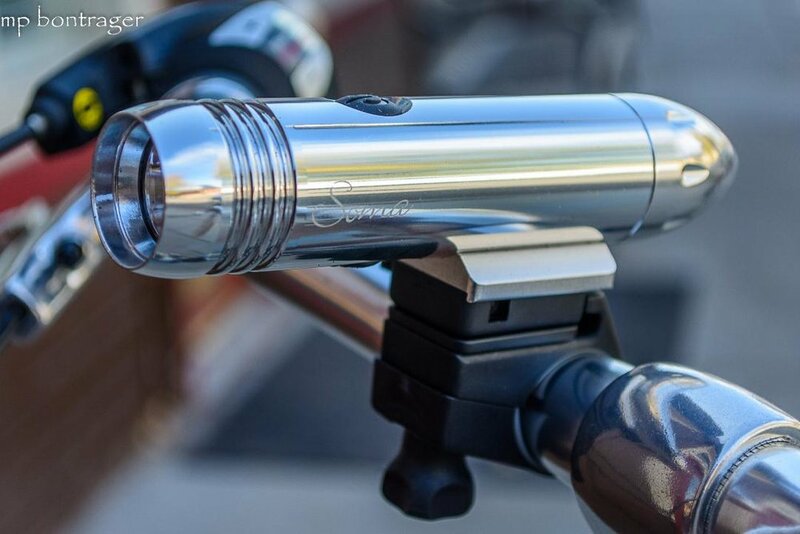 All bicycle accessories are at least 25% off through the month of November. There is too much to list so plan to stop in and see for yourself! Resume normal hours on Tuesday, Novemeber 27. 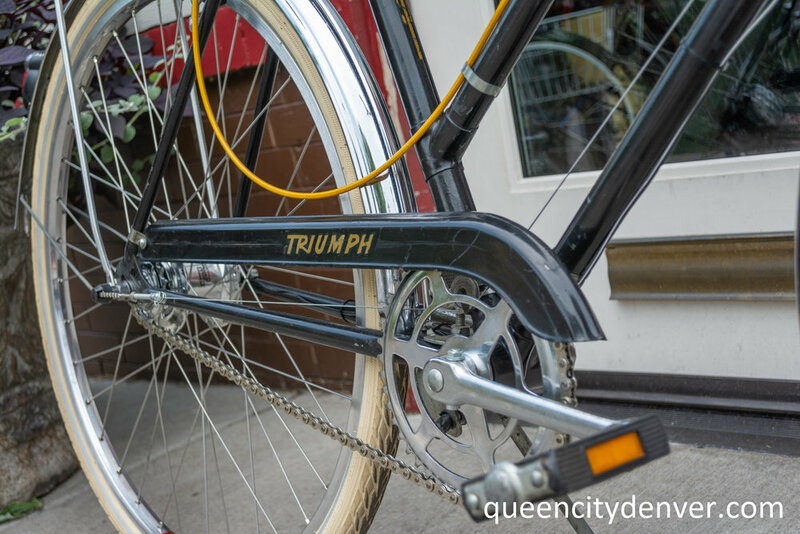 We sell and build fun to ride, all-around steel bikes at Queen City Cycle. Often these type of bicycles are labeled as; touring, adventure, gravel grinder, cyclocross, or randonneur bicycles. We like to keep it simple we describe our line-up as all-around bikes that will reliably take you there. Surly’s new 650b bicycle, the Pack Rat, falls into our favorite all-around bike description. The Pack Rat is a chromoly frame set with “not too skinny” tires, and a dependable component package. We brought in the Pack Rat in as soon as possible and have been duly impressed. You may have noticed that a lot of cyclists have been attaching front racks to their bicycles with mixed results. Many road bikes and other 700c bikes are encumbered by a 30lb load attached to the front of the frame. Surly set out to design a bike frame that will carry a front load without compromising the handling of the bike. They succeeded! Surly’s new Pack Rat is totally stable with a front load, it’s downright nimble. Although it is classified as a touring bike you won’t want to enlist the Pack Rat just for tours, it’s just too much fun to ride. The Pack Rat rides so well with a full front load this is the bike I choose for shopping and commuting in and around town. The frame features a lowish trail geometry combine the frame geometry with the 650b wheel set, the Pack Rat is indeed an ideal choice for hill climbing and gravel rides. This is the type of frame set that any cyclist craves for their all day rides. I agree with the Surly folks in choosing Cantilever rim brakes, they are lightweight, affordable, and easy to work on while out on the trail. 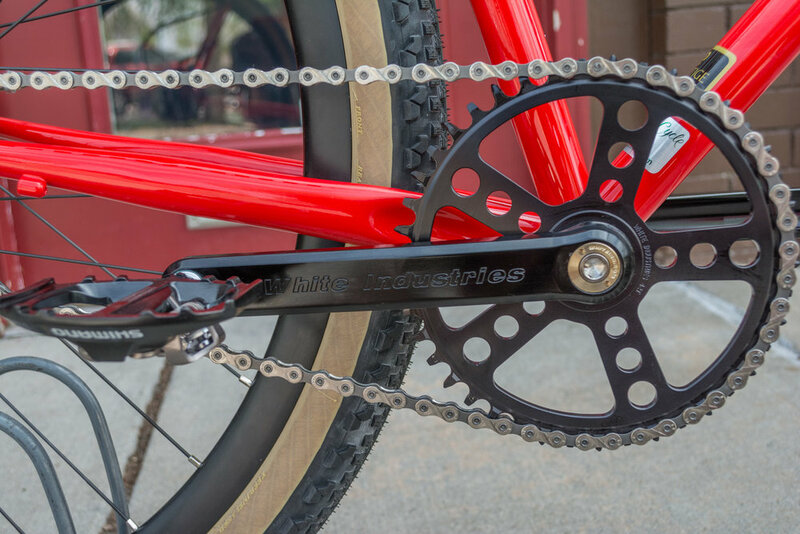 Lastly the rear drop outs will accommodate multiple drive train configurations including an internally geared hub. We are thrilled to have Surly’s new model in the shop, their Pack Rat model hits the mark on what every Denver cyclist is looking for. But…! there is Breezer Bike’’s new adventure bicycle to consider, The Doppler. The Doppler offers traditional road bike geometry, not race geometry, more forgiving than that. It’s ChroMoly steel frame set in conjunction with it’s 650b wheels, this bike is designed to ride all terrain. 650b wheels are particularly strong, they able to support additional weight such as loaded panniers. Their ability to accommodate a much wider tire than most road bikes has made the 650b a favorite amongst cycle tourists. This is not a timid, pavement only bike. The is a ready for mountain trails, gravel roads, or any off-road path you find type of bike. Breezer won us over 10 years ago with their city transportation bikes. Now we fully embrace this new bike genre that Joe Breeze has designed. 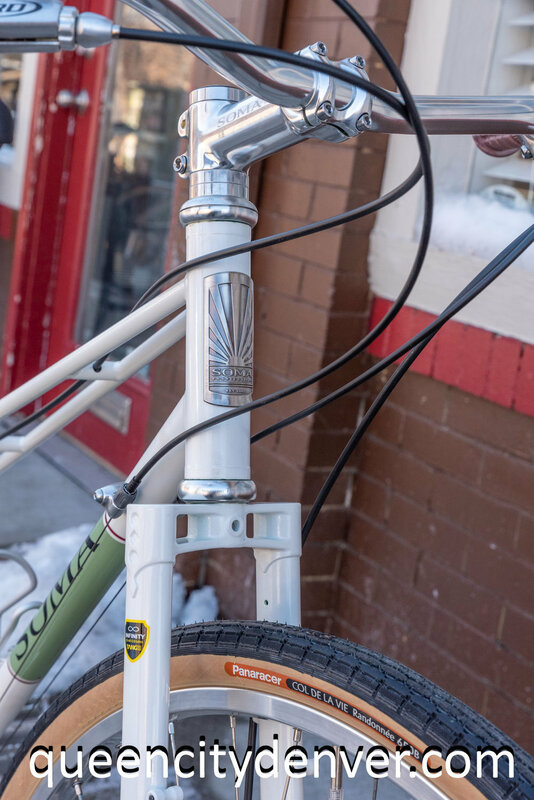 The new Doppler is a fun all-around bicycle that will suit any Colorado lifestyle from city streets to suburban trails to off road adventures. We are back home and open for business. After many months of reading, planning, and researching we managed to pull off an unprecedented 2-week camping trip abroad. It was time to explore a different corner of the world and what a phenomenal trip it was. We experienced a few bumps in the road but doesn’t this speak to life in general?! Purchase a bicycle that fits the terrain you plan to ride. Bicycling is the keystone to an active lifestyle. I can't think of a more efficient way to explore our neighborhood, complete errands, and stay energized. Whether you are physically fit or not bicycle handling skills take thought and practice. If you commit to riding your bicycle at least 3 times a week in a matter of 3 weeks you will become a much more confident rider. I am always looking for an excuse to ride my bicycle and try to add a few core workouts in-between. Flexibility and strength will allow you the confidence to ride and the more you ride the easier it becomes. Selecting a bicycle that fits seamlessly into your lifestyle is an important step to achieving your bicycling Zen moment too. 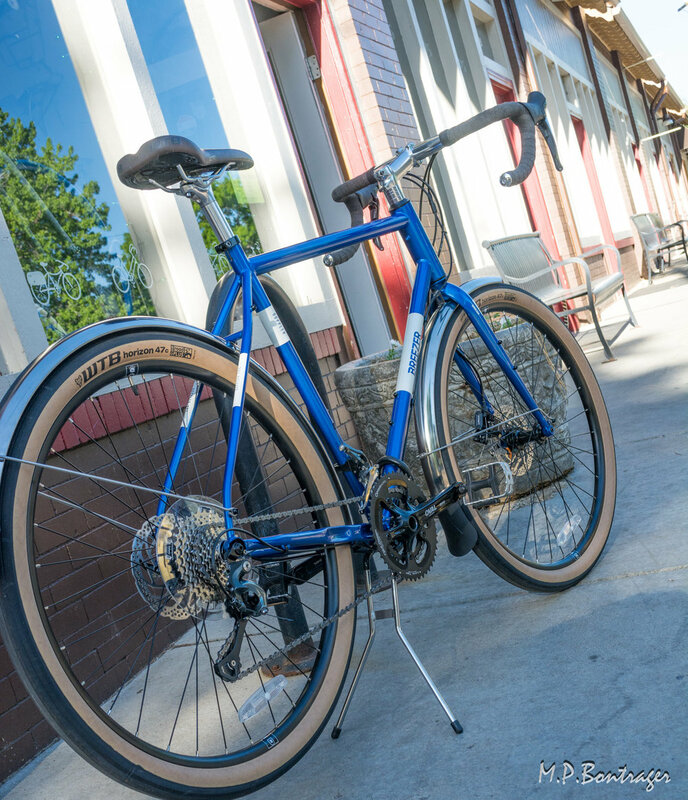 We'll happily offer you ideas for your next perfect bicycle be it a city specific bike, a gravel bike, a fixie, or a custom steel-frame road bike. It isn’t necessary to own 4 different bicycles but it does pay dividends to own a bicycle that reflects your personality. Since cycling brings fitness and joy I would not regard the purchase of a custom built bicycle as an unwarranted extravagance, how could you? Which leads to the next story. Nine years ago, at our previous location on Lowell Blvd, we met our neighbor Treasure. After many visits to another bike shop she was totally frustrated with her bike because the derailleur would not hold its adjustment. I convinced her that Ethan would be able to diagnose the problem and in turn help her avoid purchasing a new replacement bike. She agreed and for all these years she has pedaled her bike reliably around town, on week long bike tours, and throughout Colorado trails without a peep from the derailleur. This year Treasure decided to purchase a new bicycle for the sheer joy of it. After much contemplation she chose to have Gallus Cycles build her steel frame set and have Ethan complete the component selection. Ethan carefully chose her components balancing the weight, reliability, and cost of each piece. With this particular build Ethan heavily considered reliable and durable components that will withstand cycle tours through the remote regions of the Southwest, areas in which Treasure enjoys riding with family and friends. Treasure’s bicycle is a beautiful machine, may it lead her to that Zen state all cyclists strive for.